If you haven't heard of Bonjour Patisserie, perhaps you know it by its old name, Patisserie Philippe? Patisserie Philippe got rave reviews back in the day, but the change happened in 2011, and I never experienced the baked goods before the change. Bonjour Patisserie has the same location, and basically the same menu, but new owner, and, well, no Philippe. Anyway, Bonjour Patisserie is located down on Townsend street, by Zynga, in an area I bike by regularly, but never stop at. And, I still haven't actually visited the cafe. I have however tasted their treats, because, why else would I be writing this? I attended a brunch catered by Bonjour Patisserie, and couldn't help but try pretty much everything. You know how much I love baked goods. I wasn't particularly impressed with anything. 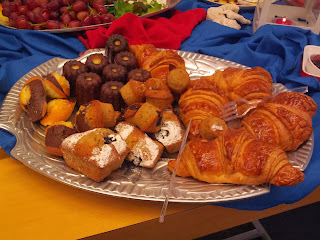 Croissants, Cannelés, Vanilla & Blueberry Pound Cake, Chocolate Madelines, Raspberry Financier. The setup was fairly simple, with a bunch of baked goods on slightly tacky silver platters. I'm not sure if the platters were provided by Bonjour Patisserie or the event host. Almost all of the goods were stacked up on one platter. There was a second platter with only two items on it, slightly less jumbled. 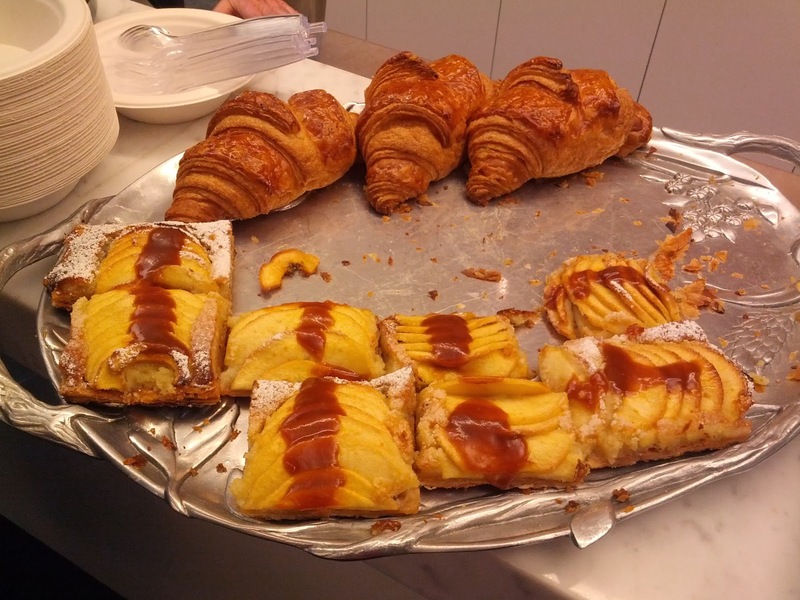 The flaky croissants were the fastest moving item, one of Bonjour's signature items. There were also ham and cheese croissants. Berries, Jam, Cream Cheese, Brie. Assorted condiments were also provided. 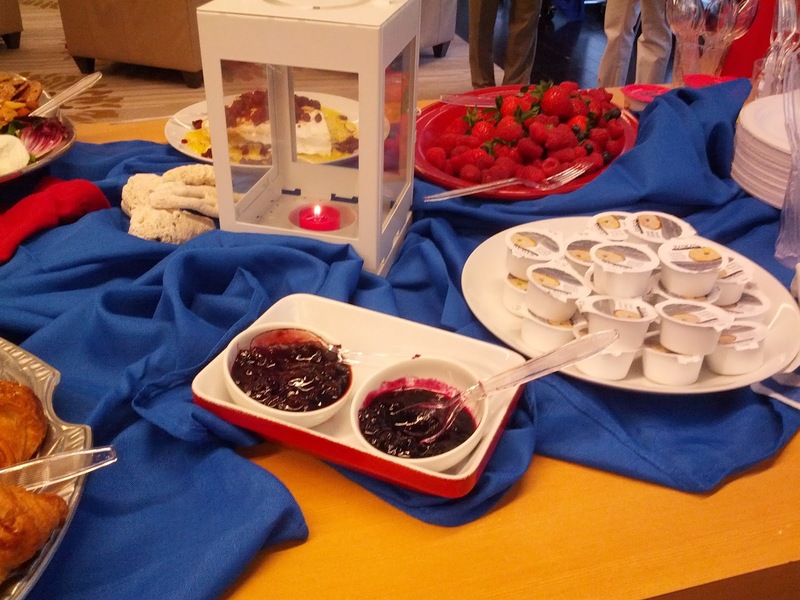 The jam on the left was really, really good, particularly with brie from the nearby cheese platter. I have no idea what it was, or if it actually came from Bonjour Patisserie. 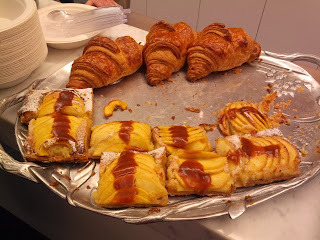 It was really delicious though, perfect slathered on the otherwise unremarkable croissants. Vanilla & Blueberry Pound Cake. "A muffin sized vanilla pound cake, baked with fresh blueberries." This was dry and pretty flavorless, although speckled with flecks that I think were almonds? I couldn't distinguish a particular flavor from them, and the description doesn't mention anything else, so I'm not sure what they were. The blueberries were plump, but there were just two on top, no more inside. Dusted with powdered sugar for a bit of sweetness. I did not like this, unsurprising I guess since I don't generally care for pound cake. Ojan usually likes blueberry baked goods, and he only took a single bite of one too. 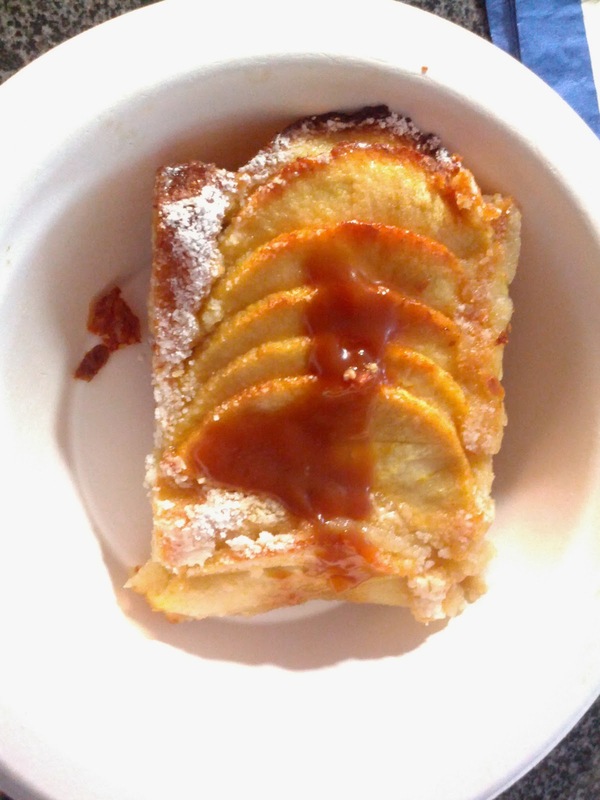 "Flaky puff pastry baked with apples and almond cream, topped with caramel." I had no idea what this was until I looked on the website later to add the description. It was the best of all the treats. I had a full slice at the brunch, and then brought another one home, intending to share with Ojan, but uh, he never got a bite. The crust was a flaky puff pastry, crispy and a bit caramelized. The next layer was a thick paste, very, very sweet. I think it was frangipane, although it didn't necessarily taste almond-y (indeed, the description says almond cream). The baked apples were nicely cooked, soft but not too soft. There wasn't really any seasoning on them though, they could have used some cinnamon. And, to top it all off, caramel sauce. And it was dusted with powdered sugar. Overall, this was very sweet, almost too sweet. When I had my first slice, I enjoyed with black coffee, and didn't mind the sweetness too much. But when I had my second slice a few hours later, it seemed a little much. Perhaps I'd just had too many sweets by that point! It had gotten a bit soggy, so I warmed it up in the toaster oven. And then, since I had a warm dessert ... I just had to add ice cream too. That helped cut the sweetness a lot, as I paired it with a classic vanilla. This was the best treat I had from Bonjour, but I wouldn't seek another out. 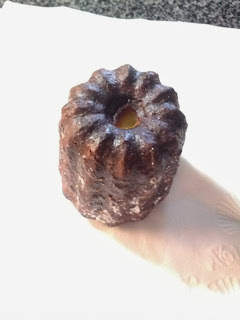 I have fond memories of the epic cannelé from Keiko à Nob Hill, one of the top meals of my life. Very few cannelés can possibly compare to those. This one surprised me, particularly given how much I didn't like the other pastries. It wasn't nearly as good as the Keiko one, but it wasn't bad. Slightly crispy exterior, super moist interior, really nice caramelized flavor on the outside. It didn't hold up at all though. I had another one just a few hours later, and the exterior turned totally gummy. I tried heating it up to make it better, but that just made it worse. Very short shelf life here! I probably wouldn't get another. 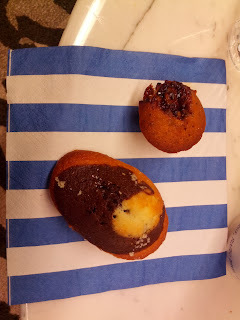 The chocolate madeline was dry and totally flavorless, no better than the blueberry pound cake I started with. Neither the white nor brown parts had any flavor. I'm guessing it was supposed to be chocolate and vanilla, although they list it just as chocolate on the site. 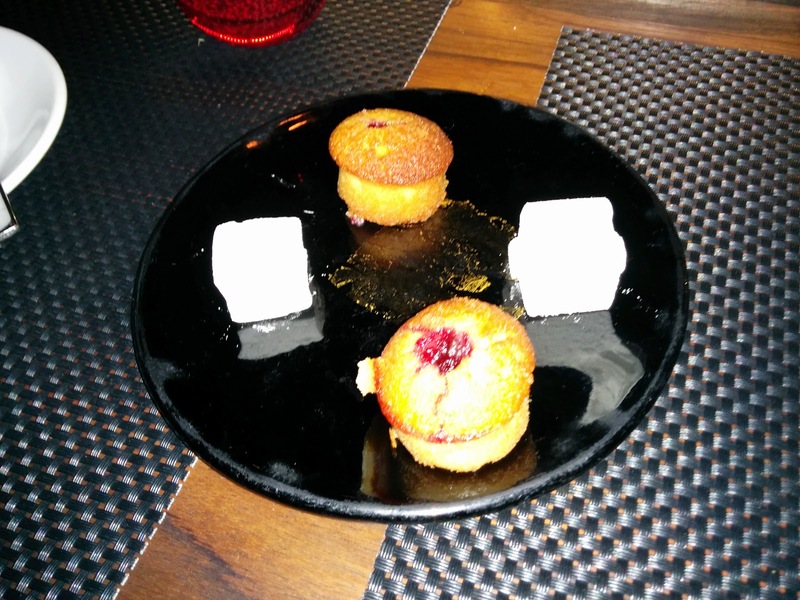 The platter also had a bunch of the financiers, some were plain, some had a jam filling. I actually kinda liked the jam filled one I picked, although I struggled to know what it was. It looked like a mini banana muffin, as it had little flecks in it, but I didn't taste any banana. Once I looked it up and discovered that it was a financier, I realized the flecks must have been ground almond. Anyway, it was sweet and moist, and the jam was tasty, just like the jam on the condiments table. Some of the jam had leaked out, and that bit was crispy. This was decent, but not remarkable enough to get again. Large group dining (as in, 30-50 individuals) is tricky. No matter what restaurant you pick, it will never measure up to the experience of when you go with only a few others. It just isn't possible. I know this. Over the past few years, I've helped organize a number of dining events for my group at work. Last year, for our holiday party, we went to my favorite restaurant in the city (Alexander's, duh), and they did a fine job, but again, it couldn't live up to the small group experience. A few years before that, when our group was only 24 members, we went to Fleur de Lys, and again, it was all good, but not remarkable. This year, we decided to plan a trip out of the city, up to wine country, to enjoy a great lunch, sunshine, and wine, obviously. There is no shortage of great restaurants in wine country. But ... which of them do large groups well? I anticipated 40-50 people. Many restaurants in the area have great sounding group dining packages, complete with private areas. They are accustomed to holding private events, as they are often venues for wedding receptions and rehearsal dinners. This made doing my research far easier than I expected. Rather than just reading Yelp reviews, focused on standard dining experiences, I could read on wedding recommendation websites, tailored towards groups. Perfect! Once I dove in, it took very little time to narrow down on my choice: Bottega, in Yountville. I've seen Chef Chiarello give cooking demonstrations in SF before, and I have been wanting to try his restaurants for a while, so it was a natural pick, particularly once I read all the raving reviews. Long story short? It was the perfect venue and the food was fantastic. If you are looking to host a group event in wine country, I highly recommend you check out Bottega. It is located adjacent to V Marketplace, a specialty shopping area, on a winery estate with stunning grounds. We arrived early and didn't mind at all; it was a beautiful day, and we frolicked in the courtyard enjoying the sunshine. Once our dining time arrived, we were invited into the private bar attached to the private dining room to begin our experience, and were encouraged to take our glasses of wine back out into the sunny courtyard before being seated for lunch. Such a perfect way to begin! The experience continued to impress as we entered the private dining room, set up with 3 tables. The decor was rustic and comfortable, yet refined. We all felt at home as we settled in. 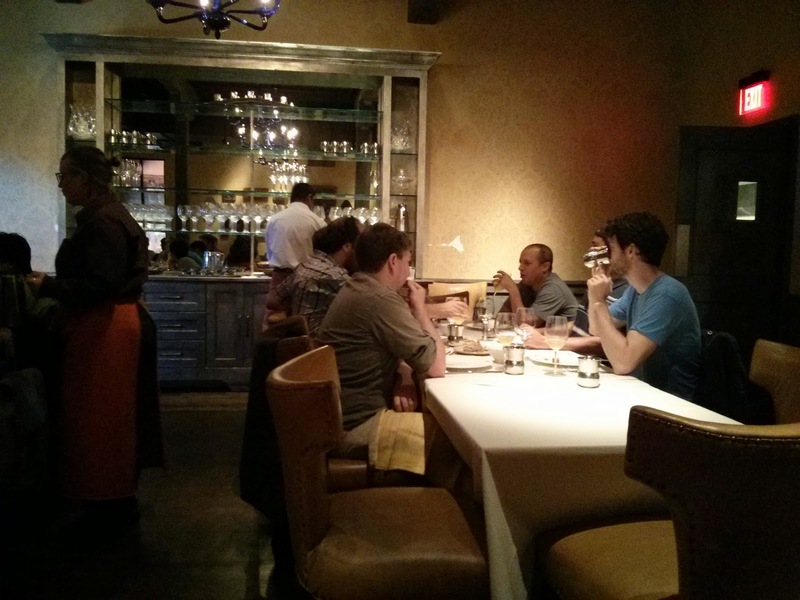 I really appreciated the seating being broken into 3 tables, rather than trying to fit everyone at a single table. With that many people, you can never talk to everyone anyway, and this setup made it feel more intimate. The only negative thing I have to say about the venue itself is that it was freezing inside. It was a big shock after coming in from the warm sunny day, but the initial shock didn't really go away during the few hours we were there. I would have been more comfortable if it were warmer. 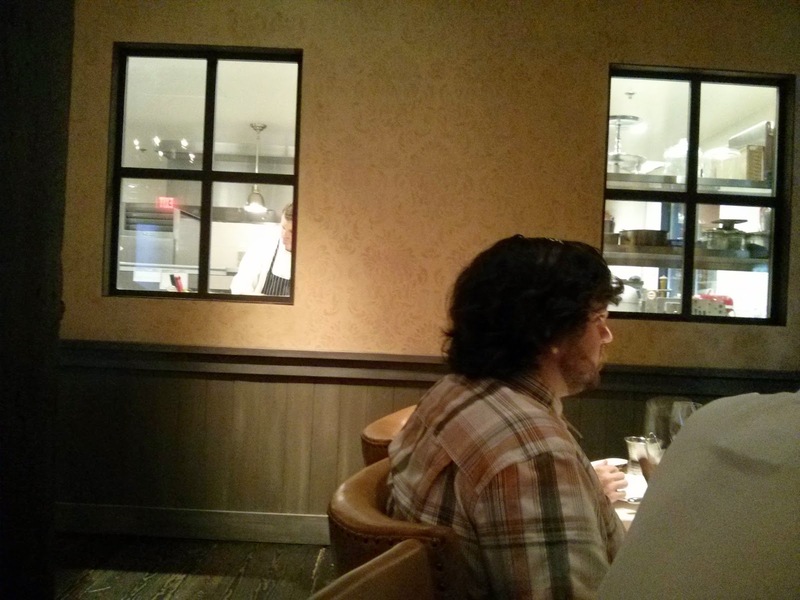 I also liked that you could spy through the windows from the private room into the kitchen. I watched one chef painstakingly roll pasta through the pasta machine all afternoon long. Speaking of the food, it was really impressive. This was the best executed group dining experience I've ever had. They managed to serve the large group all at once flawlessly, with hot, fresh, well prepared food, plated nicely. I had no idea it was possible to achieve these results with such a large group. Some of the dishes, and in particular the ones that I expected to be hardest to execute, were very, very impressive. I would have been impressed even if I was dining with just one other person, much less in a group event. 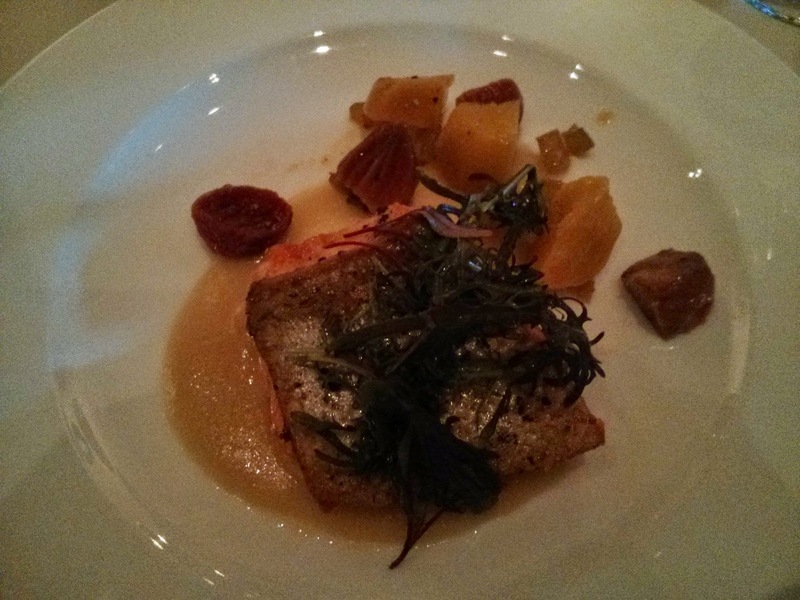 The salmon was better than what I've had at many nice restaurants, and the gnocchi was mind blowing. If they do this well with groups, I really need to go back for a regular dinner sometime. The staff were all friendly and professional. The only flaw I experienced is my decaf coffee was forgotten. Besides that, they handled all our special requests seamlessly, although, some of the special diners were served a bit later than the rest of the group. 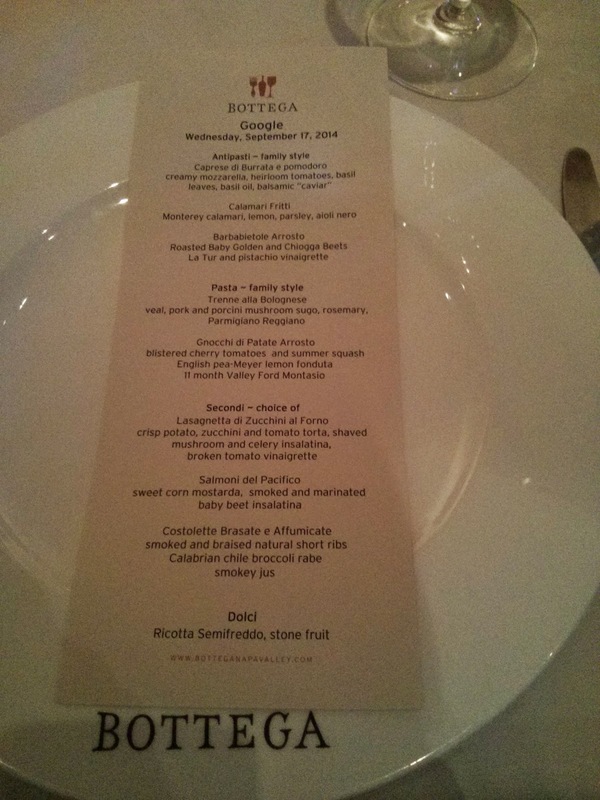 I'll certainly return for a regular dinner, but I highly recommend Bottega for large events. You'd be hard pressed to do better. Since we were a large group, we had to arrange a menu in advance, from the special group dining menu. I of course had a major hand in picking our menu. There were several options for format, but we went for the standard recommended group experience, composed of 3 antipasti to start, followed by two pasta dishes, all served family-style. After all those family-style courses, which were certainly enough for a full meal anyway, there was a plated entree (diner's choice, from a pre-selected set of 3), and then dessert. For only $85 per person. It was definitely a great value, particularly given the quality of the food, and the ridiculous amount of food served. There are smaller "luncheon" menus available as well, which, if you aren't feeding an army of hungry software engineers, might be more appropriate. Immediately once we were seated, we were brought loaves of sourdough bread, served with melted butter with parmesan and herbs. Since I dislike sourdough, and knew how many more courses were coming, I didn't try any, but my co-workers all loved it, particularly the cheesy, herby butter. The meal began with antipasti. In advance, we selected 3 items (out of 6 choices), all of which would be served family style to the whole group. We narrowed down the selections quite easily, eliminating the salads and charcuterie platters, as those didn't seem very unique. To please the folks who wanted something a bit healthy, we started with the Roasted Baby Golden & Chioggia Beets: La Tur espuma / pistachio vinaigrette. I felt no need to try this, again, knowing how many more delicious options were about to be headed our way. My restraint however, ended here. Burrata Caprese: creamy mozzarella / heirloom tomatoes / basil leaves / basil oil / balsamic “caviar”. Next came my top pick from the antipasti list: burrata! This dish is also served on the regular menu. It came on huge platters as expected, but, interesting, the servers came around and served us all individually from the large platters. I actually really would have preferred to serve myself, since there were a slew of stunning looking tomatoes in assorted colors, and I would have surely gone for yellow or green, rather than the reds I was given. The burrata was delicious, as I hoped. The center was super creamy. Served perfectly ripe. You might say that of course it was tasty, it is burrata after all, but, sometimes, it isn't served at its peak, like at Auberge, where we had disappointing burrata just a few weeks prior. The tomatoes were just ok. We were nearing the end of tomato season, so it is to be expected that they aren't as awesome as earlier in the summer. They were well seasoned with olive oil, salt, and pepper, and garnished with basil. 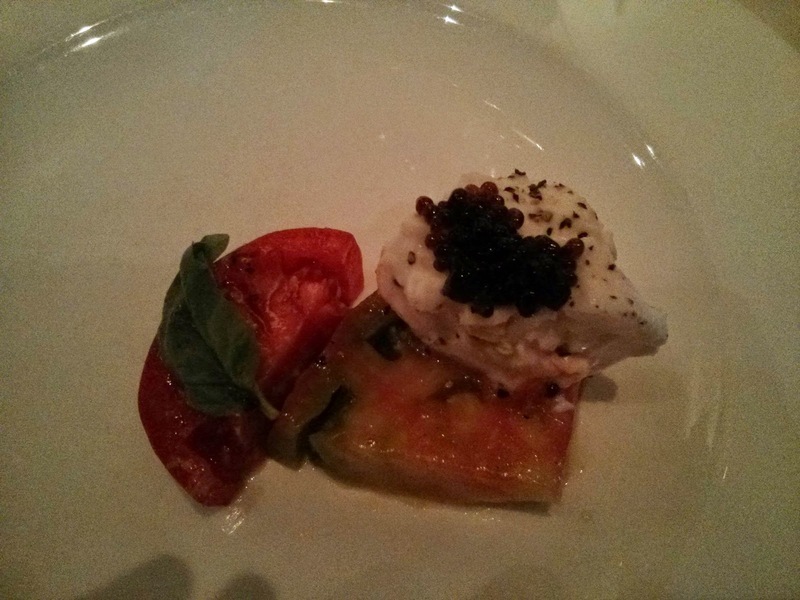 The balsamic caviar was flavorful, and a fun, way to add the standard vinegar component to the dish. Overall, a very solid execution of a classic dish. Bonus points for using burrata instead of mozzarella in the caprese too! Monterey Calamari Fritti: lemon / parsley / aiolo nero. 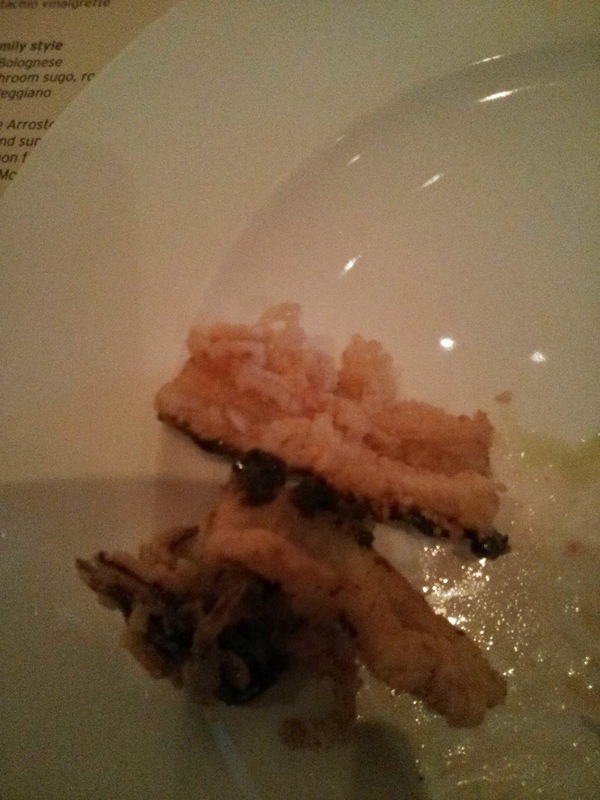 The third antipasti we choose was the only hot option: calamari fritti. It came on a huge platter, but, this one was passed down the table rather than being served individually, which I preferred. This id is also available on the regular menu as an appetizer. It was ... just ok. It was served piping hot, which is impressive for such a large group, particularly for fried food. The calmari was not chewy, a good assortment of rings and bodies, was nicely breaded, and was not oily. I can't quite pinpoint what I didn't care for, as these all sound like winning attributes, but it just wasn't that flavorful. I think the real problem was the garnishes, and the family-style setting. Each platter had a single grilled lemon on it, which was awkward for group dining. What if one person just ... took it? Were we all supposed to squeeze it with our questionably clean hands over our own dishes and then put it back? It certainly wasn't just for show. A little acidity would have brightened the calamari up considerably. Likewise, there was aioli nero, which I certainly wanted since I'm all about sauces and dips, but, there was only a artful smear on the platter, no extra provided, nor any drizzled over the dish. For utensils, we had only serving tongs, so there was no real way to even attempt to get some of the decorative smear onto your individual plate. This was my least favorite of the antipasti, and the only example throughout our meal of the large group dining format not working well. Next we moved on to the pasta courses. The group menu contained three options: vegetarian gnocchi, traditional bolognese, or a rabbit pasta. We had the option of picking just one for everyone to enjoy, which would be plated individually, or two, served family-style. Since two is better than one, we went for the family-style. We needed to included a vegetarian option, so the gnocchi was an easy pick. 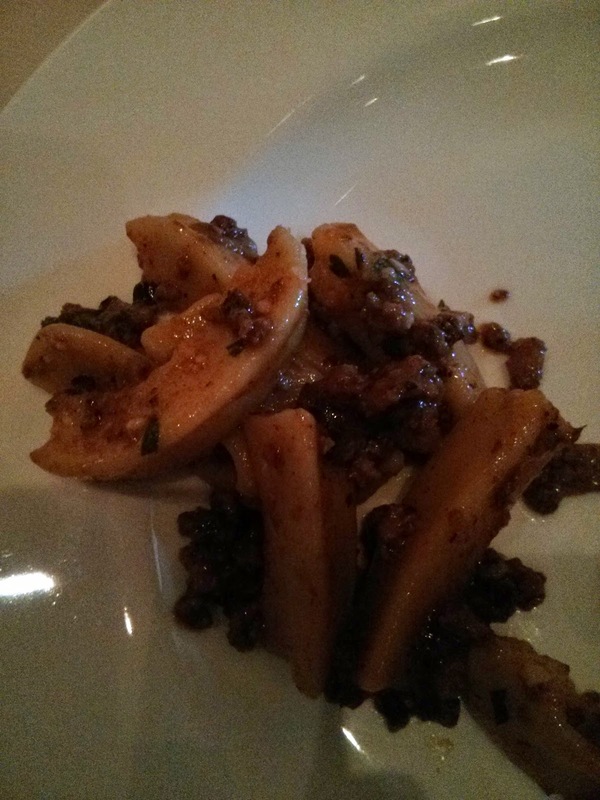 The bolognese is a dish Bottega is known for, so it was easy to pick that one too. Like the calamari, they were served on large passed platters, so we could help ourselves. Our gluten-free and non-dairy diners had a risotto instead, individually plated for them. The timing did seem a bit off on their dishes, as they arrived long after our pasta. Pan Roasted Potato Gnocchi: blistered cherry tomatoes and summer squash / English pea - Meyer lemon fonduta /11 month Valley Ford Montasio. The first pasta to arrive was the vegetarian gnocchi. It was the hit of the meal. Absolutely everyone loved it. Of all of the giant platters we received throughout the course of the meal, this is the only one that was actually completely emptied. I went back for seconds, and thirds, and then, doh, it was gone. So much food was provided throughout this meal, but, I totally would have had more of the gnocchi. So, what made it so delicious? First, the gnocchi was ridiculous crispy. I loved the texture. Next, the cherry tomatoes were incredibly flavorful. Anything that was lacking from the heirlooms in the caprese did not apply here. Perhaps it was the blistering that drew out even more flavor? And the, the summer squash. Yes, it was late summer, and I stopped being interested in summer squash long ago, but this was probably the best summer squash I've ever had. Seriously. Absolutely bursting with flavor, and, presumably, sautéed with plenty of oil. Finally, there was the English pea-Meyer lemon fonduta. It was on the bottom of the platter, and I'm glad I took the extra effort to scoop some up when serving myself. I didn't taste the Meyer lemon, but the pea flavor was there, and it was very creamy, making for a quasi-sauce. You know I'm a sauce girl, so it was a bit strange for me to love an almost sauceless dish, but honestly, it didn't need it. The gnocchi was just absolutely remarkable on its own. The dish was finished with grated Montasio cheese too. I was shocked by how good this dish was, on every dimension. 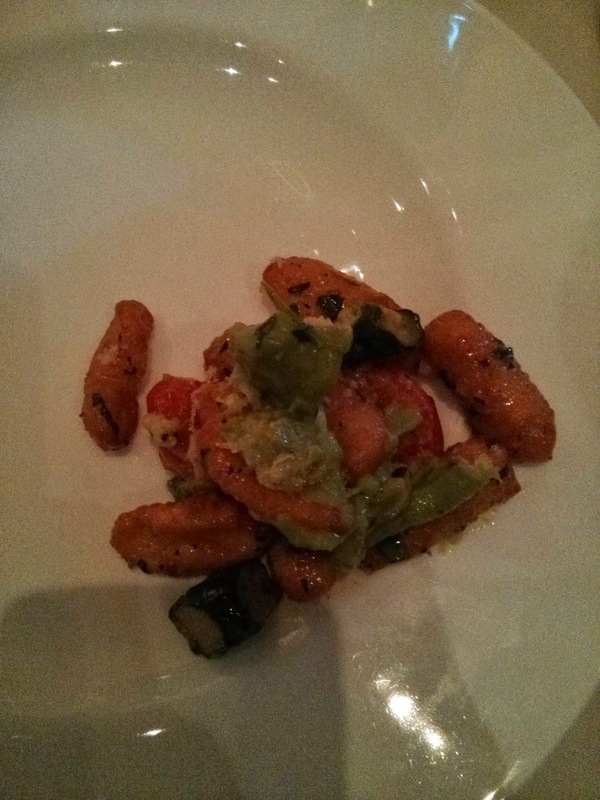 They nailed the crispness of the gnocchi and the flavors of the vegetables, in a way that would have been impressive when served individually, much less on a giant platter. It was also served piping hot. I'd return to Bottega, just to get this dish. Unfortunately, it does not appear on any of the regular menu. A ricotta gnocchi (I think flour based rather than potato) is available, with pomodoro sauce, but, that is obviously an entirely different dish. Trenne alla Bolognese: veal, pork and porcini mushroom sugo / rosemary / Parmigiano Reggiano. The second pasta dish was less successful, Bottega's famous bolognese. When served as part of the regular menu, the pasta is taglierini, but otherwise, I think it is the same dish. I don't really like pork, but I think even the pork lovers found this dish to be a bit lacking, as they all went back for more gnocchi instead. The pasta wasn't particularly remarkable, a bit mushy. It was pretty oily, and the serving dish was left with big pools of oil on it. We had a lot of this left over, and no one wanted seconds. We all just kept looking around wistfully for more gnocchi. And finally, the main course. Because, you know, 3 appetizers, bread, and two pasta courses wasn't enough already! The main course was a plated affair, and each diner was able to select their choice of entree at the start of the meal. Diners were able to choose from 3 options that we had pre-selected, out of a list of 5. Since we had vegetarians in the group, we had to select the single vegetarian dish, Lasagnette di Zucchini al Forno: crisp potato / zucchini and tomato torta / shaved mushroom and celery insalatina / broken tomato vinaigrette. No one at my table ordered it, so I don't have anything to report on that. For a meat choice we went for the Costolette Brasate e Affumicate, aka, Smoked & Braised Natural Short Ribs: Calabrian chile broccoli rabe / smokey jus. A number of diners, Ojan included, picked this, and seemed to really enjoy it. I of course snuck a bite of Ojan's dish. The short ribs were fine, moist, tender enough, but, short ribs are never something I like. Served over a mediocre puree. The meat options that we decided not to offer were roast chicken (boring!) and wood grilled lamb chops. For an additional fee, we could have offered a veal chop or steak for $15 more per person. Our final selection was the single seafood choice, salmon. Segudi: Salmoni del Pacifico: sweet corn mostarda / smoked and marinated baby beet insalata. I obviously picked the salmon. Just like the gnocchi, this was really impressive, not only in general, but particularly for large group dining. I asked for mine medium rare, and, it actually was. No one else specified how they wanted theirs cooked, and several others commented on how it was more cooked than they'd like, so, it was definitely a good idea to specify this when ordering. The most impressive part was that it somehow had perfectly crispy skin. Seriously, how did they pull this off for a large group? The sweet corn mostarda was absolutely amazing. The corn flavor was strong, as was the tang from the mustard, it was incredibly creamy, and went perfectly with the salmon. I've always had fruit mostardas before, but, the sweetness of the corn worked just like fruit would here. Well dressed greens perched on top added a bit of lightness and freshness. The marinated beets were fine, but, like I mentioned when skipping the beet appetizer, I find beets rather boring. However, the little tiny cubes of pickled beets were incredible, and I'm glad I tried them. I loved how they complimented the mostarda in particular, so much tanginess. This was just crazy impressive for large group dining. We were all served at once, the food was all hot, the crispy components still crispy, nothing was overcooked and dried out, everything was plated beautifully ... I still can't fathom how they did this. The salmon was clearly the winning entree, and I loved every bite of it. I was shocked at how much I was able to eat at this point in the meal, after all that gnocchi. I'd gladly order this again. Finally, we approached the end. The group menu allowed us to pick only one dessert, individually plated and served to everyone (our dairy-free diner was offered a sorbet instead). The options that we didn't pick for the group were tiramisu, semolina cake, chocolate hazelnut cake, cookies, or gelato. Instead, we went for the semifreddo, since it sounded the most unique. 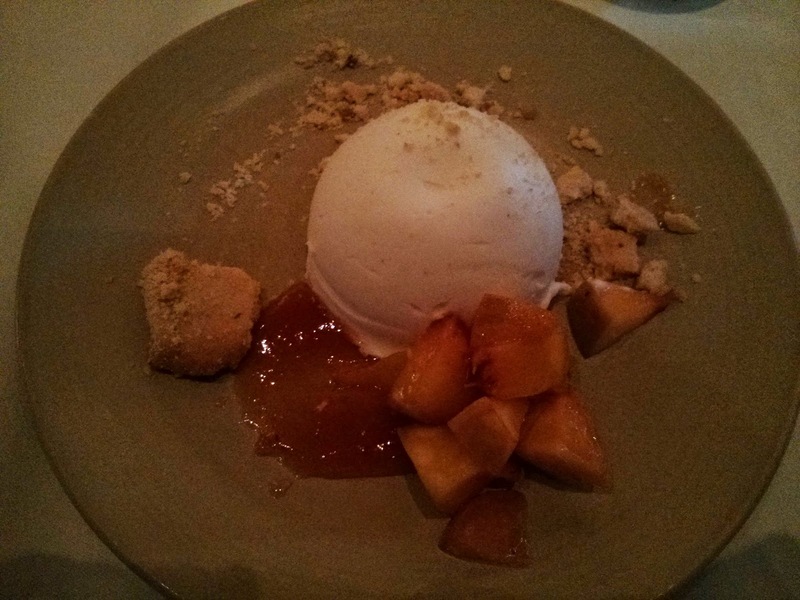 Dolci: Ricotta Semifreddo / Stone Fruit. You know how much I love dessert, so I was quite excited for this finale, even though I was completely satisfied by the burrata, the gnocchi, and the salmon. Sadly, it was the weakest dish of the meal. The semifreddo didn't taste like ricotta to me. In fact, it didn't really taste like much of anything. It also stayed far more frozen than I expected, even with time, it didn't get a creamy melty consistency. The crumbled cookie bits on top just seemed like hard, stale cookies. Slightly buttery, but really not very good. The stone fruit however was delicious, fresh peaches. I think they may have been sweetened additionally, or perhaps they really just were that awesome. I also enjoyed the fruit puree on the plate. But overall, this was not very good. Great presentation though, particularly for a large party. Along with dessert, coffee was offered. I ordered decaf, it was forgotten. Regular coffee was brought in carafes for the table. On my recent business trip to Europe, I had exactly 1.5 days to spend in London. I arrived with Emil on Thursday evening, fairly burnt out from our time in Zurich, and before that, Mallorca. For dinner, we were planning to just check out the offerings in the executive lounge at our hotel, and if that wasn't sufficient, perhaps venture to a nearby place for fish and chips. Casual, simple, easy. But the executive lounge failed to impress, and after a glass of mediocre bubbles there, I considered other options. I remembered that there was a L'Atelier de Joël Robuchon in London, somewhere. I had no idea where it was in relation to where we were. But I quickly looked it up, and saw that the restaurant consists of 3 separate spaces, one of which is a bar area. The website implied that it served food. 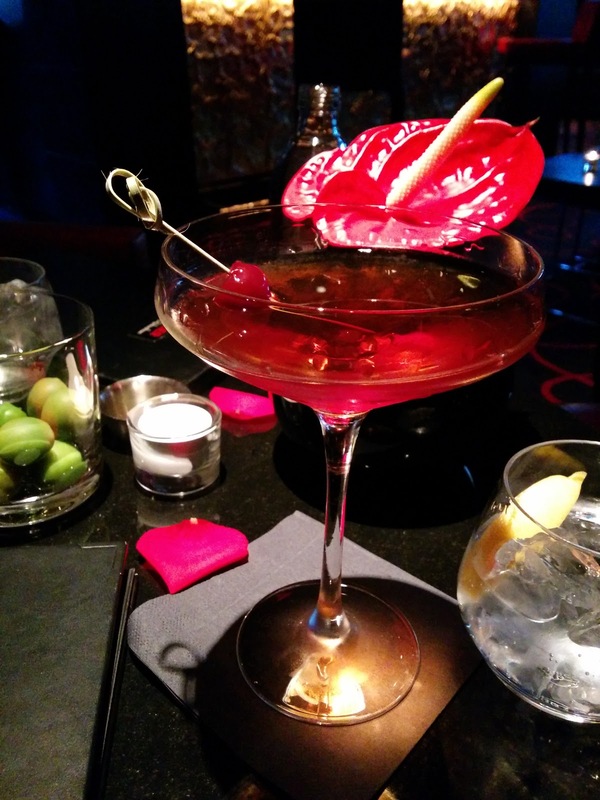 We really enjoyed our experiences at both La Table de Joël Robuchon and L'Atelier de Joël Robuchon in Tokyo, so it seemed only fitting that we check out the London branch, you know, for research purposes. Just to compare. I felt a bit ridiculous suggesting this to Emil, given that we were intending to have a very simple night, but, he didn't exactly need convincing to go do fine dining, and the next thing I knew, we were in a taxi on our way. We were planning to just get a light bite in the bar area. We arrived and went straight to the bar, on the top floor, the Salon Bar and Terrace. It was a stunning space. Just like the L'Atelier in Tokyo, the color scheme was red and black. Inside was comfortable seating, even a fireplace. It was an incredibly welcoming environment. The entire space felt classy, intimate yet comfortable, very well thought out and cohesive. The large terrace area looked equally inviting, particularly on a warm evening. Everyone inside looked, well, happy. Even though I was exhausted from travel, I was thrilled that I'd suggested this. We settled in to our seats, and a glass of olives was brought out, along with cocktail menus. The cocktails sounded fantastic, and we both eagerly ordered one. "Woodford Bourbon, Maraschino Liqueur, Carparno Vermouth, Homemade Gingerbread Syrup and Angostura Bitters"
I picked the Gingerbread Manhattan. I really enjoyed it. It was spicy from gingerbread syrup, sweet from the maraschino liqueur, and bitter from the Angostura. So balanced. So complex. I of course appreciated the maraschino cherry garnish. I'd gladly get another. Initial drinks taken care of, it was time to look at food. The bar menu we were given just had a list of "les brouchettes", nothing we really wanted, so we asked to see a food menu. We were presented with menus. 5 or 8 course tasting menus were available, or, a la carte, with a menu divided into small plates, appetizers, and mains. The menus were filled with our favorites. Every single category contained at least one dish with foie gras, which even though we'd had some of during other legs of this trip, we couldn't resist since it is banned in our home state of California. The list of star ingredients also included scallops and crab. Basically, yes, everything I like. We painstakingly picked out a few items (sooo hard to narrow it down! ), and asked to order food, menus in hand. Our server was confused. "I thought you just wanted to see the menus", she told us. "You can only order les brochettes in here". We were devastated. Tease us with these amazing menus? We had no choice. So, even though I wasn't remotely dressed for fine dining, and even though we were planning to just get a simple bite to eat in the bar, we asked if it was possible to get a real table. The restaurant is broken up into two further spaces, La Cuisine de Joël Robuchon, a table concept, and L'Atelier, counter concept. Since we knew I wasn't dressed for a real sit down meal, as I was in casual clothes and had just stepped off a plane, we asked about L'Atelier. A few minutes later, our server came back to tell us that yes, we could be seated, although we'd be at the end of the counter. This was fine with us. Somehow, our just grabbing fish and chips at a nearby shop had turned into Michelin star dining. I suppose, you might not expect much less from the pair of us. So, down to the restaurant we went. It reminded me a lot of the L'Atelier in Tokyo, it is clear that they aim to maintain consistency between the different outposts. Most of the space, just like in Tokyo, was occupied by a large open kitchen with counter seating. A few tables completed the space. Also as in Tokyo, there were large displays featuring fruits and vegetables, and a huge wall of plants. As expected, we were indeed seated at the end of the counter, for which several members of the staff apologized. They were the worst seats in the house. But, we randomly walked into a Michelin star establishment and got seated at prime time, so, we weren't complaining. Service was good, attentive and fast, our server worked from behind the counter the whole time. The food was good, but I did prefer both L'Atelier in Tokyo, and obviously La Table in Tokyo, more, which I suppose makes sense, given that they both have 2 Michelin stars, and this had only 1. Overall, the food was all well executed, and I had few technical complaints, but nothing left a lasting impression. Amuse Bouche: dashi custard with sundried tomato and asparagus foam. Soon after we ordered, we were presented with an amuse bouche, a layered creation in a little cup. Like the cocktail, it was an exercise in balance. The custard on the bottom was warm and creamy. The dashi added an umami quality. The foam was ... well, foamy, and tasted mildly like asparagus, but the fresh bright asparagus flavor was accented by further bits of asparagus inside. This was warm and comforting, yet quite flavorful, and a nice way to start the meal. I enjoyed it. Bread Basket, Cone of Butter. We were soon presented with a bread basket. This looked familiar! 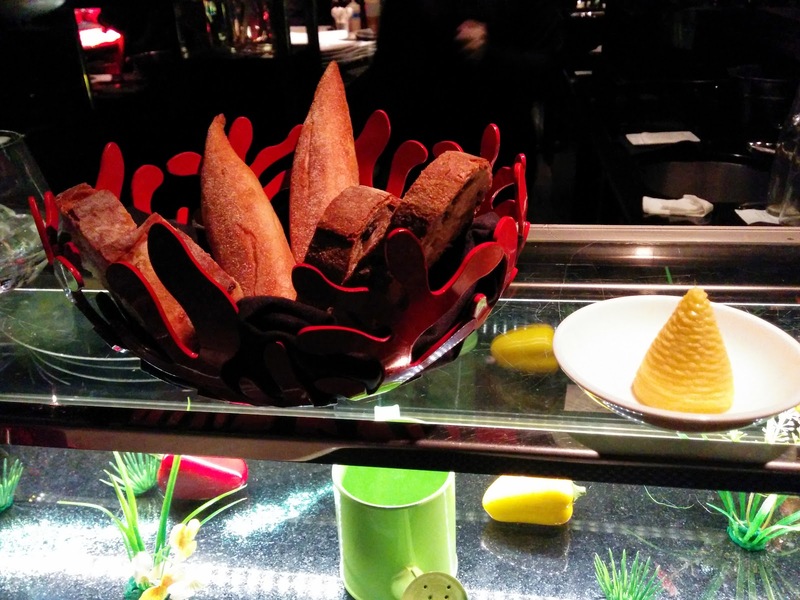 Yes, it was the exact same basket that we had at L'Atelier in Tokyo! The basket itself was the same, although, this time it was filled with a different bread selection. It had the same petit baguettes, but instead of a crusty hard roll and the fluffy croissant-like roll I loved in Tokyo, the other options were sliced varieties. Not particularly exciting, and all served cold, but I of course still tried them all. The petit baguette was adorable, had a good crust on it, but tasted a bit stale. One sliced variety had almonds, the other olives. Both had a good crust and were quite moist. The olive one had a strong olive flavor. But .. it was still just sliced bread, and I really wasn't into any of the options. In Tokyo, some of my companions were upset because we didn't receive butter or oil at L'Atelier, which that was not the case in London. The butter came on its own plate, in a cone shape. It was soft, but otherwise, unremarkable. This was a poor showing of a bread basket. Cold, sliced bread? Even if it is housemade and fresh, who wants cold sliced bread? LE TOURTEAU aux herbes, guacamole légèrement acidulé". £19. We started with a dishe from the "small plates" menu, the le tourteau, or, "crabmeat seasoned with fresh herbs, slightly sour guacamole". Since I am allergic to avocado, we asked to have the guacamole on the side, which they provided in its own little cup. The crab was light and well seasoned. It was accented by good citrus (orange?) notes. Garnished with edible flower petals. The most interesting part of the dish was what the crab was served on top of. It seemed to be some sort of cracker, something baked and crunchy, but we couldn't figure out what it was actually made of. The plate was finished with an herb oil, which paired well with the crab. Overall, a very light, fresh tasting dish, a nice easy start to the meal. My second favorite dish of the night, but Emil's third pick. 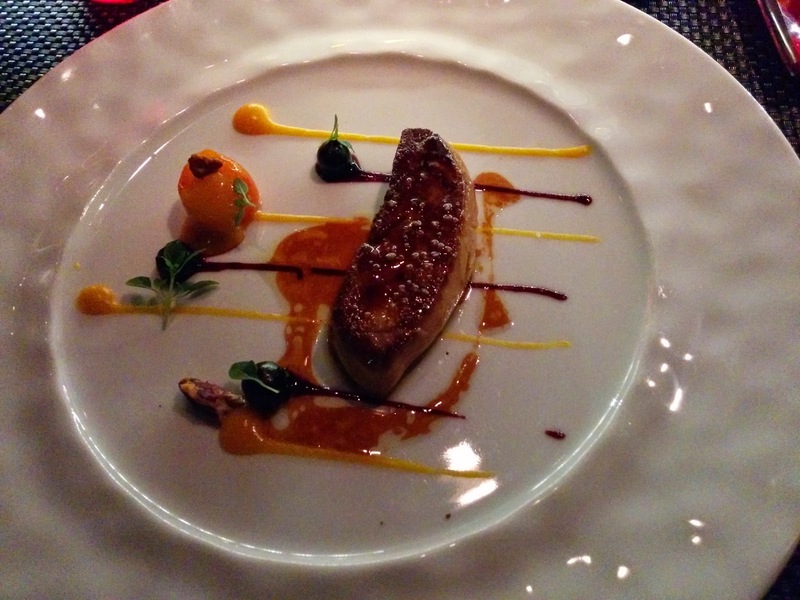 LE FOIE GRAS chaud de canard, fruits rouges et kumquats. £16. And of course, being outside of California, we had no choice but to order foie gras. Foie gras appeared on the menu in several forms, but we choose the seared version, another pick from the small plates menu: "pan seared duck foie gras, red fruits and kumquats". It was plated very artistically, with stripes of kumquat and fruit purees, along with whole blueberries and kumquats. Topped with the perfect amount of sea salt. It was served hot, on a hot plate even, clearly delivered to us rapidly from the kitchen. The foie was good, very creamy, quality, no veins. The sear was good, but I would have preferred even more of a crust on it. The kumquat emulsion was slightly sweet, a nice pairing with the foie. There were also a few chunks of pecan which gave some crunch, but they otherwise seemed a bit out of place. 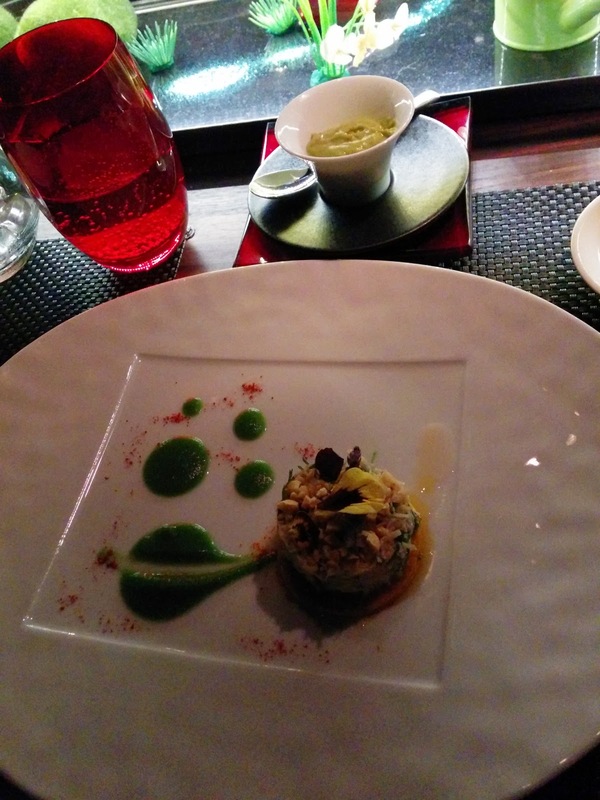 At L'Atelier in Tokyo, we had the seared foie gras as well, but there, it was served atop a creamy cheese risotto. I preferred the Tokyo version. This was good, again, nothing wrong with it, but my 3rd pick of the night, Emil's 2nd. LES NOIX DE SAINT-JACQUES saisies, conchiglioni farci et émulsion d’asperge, side of Pommes Puree. £43. From a main dish menu, we selected the scallops, as we both love them: "seared Scottish scallops, stuffed conchiglioni pasta and asparagus emulsion". This was a fabulous dish. 3 large scallops, cooked just slightly more than the mid-rare I'd prefer, but still nicely done, sweet, meaty, and delicious. They reminded me of how much I could love scallops. The conchiglioni were two large shells, stuffed with a seafood custard. I'm not sure if the filling had any ricotta as is traditional in a stuffed shell, it seemed more egg based perhaps. The shells were absolutely perfectly cooked, al dente. 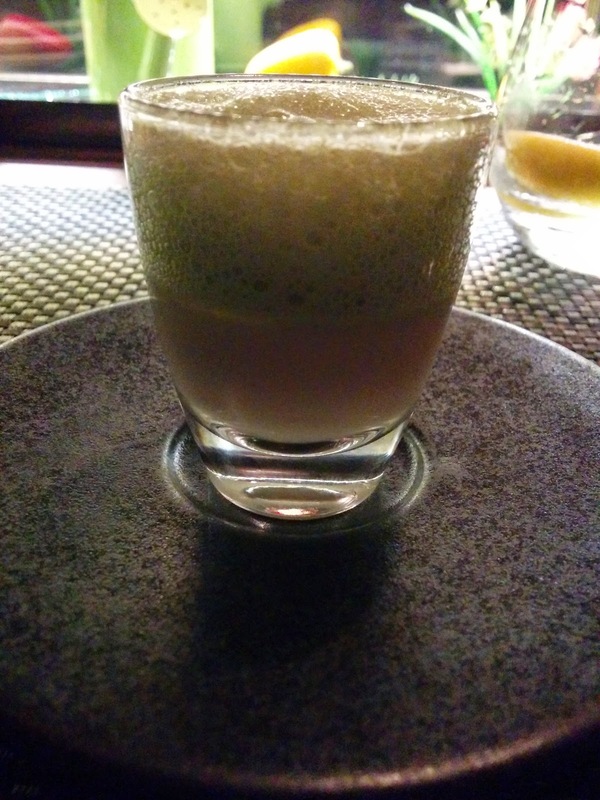 The sauce was a green asparagus foam, and, just like in the amuse, asparagus flavor was deepened by shaved asparagus in addition to the foam. Although not mentioned in the description, the dish also contained 3 large chunks of morels, which I absolutely loved for their meatiness and texture. All together, perhaps this was bit of a strange pairing of ingredients, but they were all quite good, and Emil and I both ranked this as our first pick, even above the foie gras. The only negative is that the dish was served barely lukewarm. I was impressed by how hot the foie gras was when it came, and this was borderline cold. Not the fault of the kitchen, but sad, because it could have been that much better. 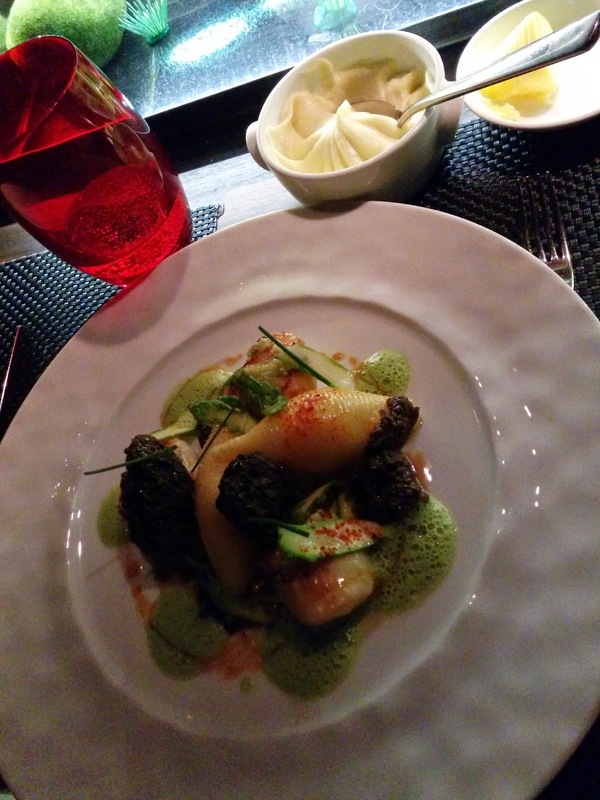 We also received a bonus dish: a side of Pommes Puree, the famous Joël Robuchon mashed potatoes. These are a thing of legend, and, even though we'd been to two Joël Robuchon establishments before, we had never encountered them. It is rumored that the potatoes were responsible for earning his first Michelin star. The mashed potatoes were indeed magic. Honestly. I have never tasted any so creamy, so rich, so smooth in my life. They reminded me more of a perfectly smooth creamy cheese than of potatoes. The creaminess is achieved through use of not only a food mill, but also a fine mesh sieve, through which the potatoes are passed several times. And the insane flavor is achieved in only one way ... the ratio of potatoes:butter is 2:1. Ok, so not magic, just butter and great technique. But wow, I can assure you, these were the best mashed potatoes I've ever had. They say that you shouldn't have more than a couple spoonfuls of these potatoes. And, even more ridiculously, in the Vegas restaurant, they had to change the ratio to 4:1, because guests were eating them in "American sized" portions, and that wasn't such a good thing. The side we got of these was small, but Emil doesn't eat carbs, so they basically became all mine. I uh, had more than a few spoonfuls. I had to take breaks. But I savored every last bite of the potatoes. I decided that they were decadent enough to be my dessert. 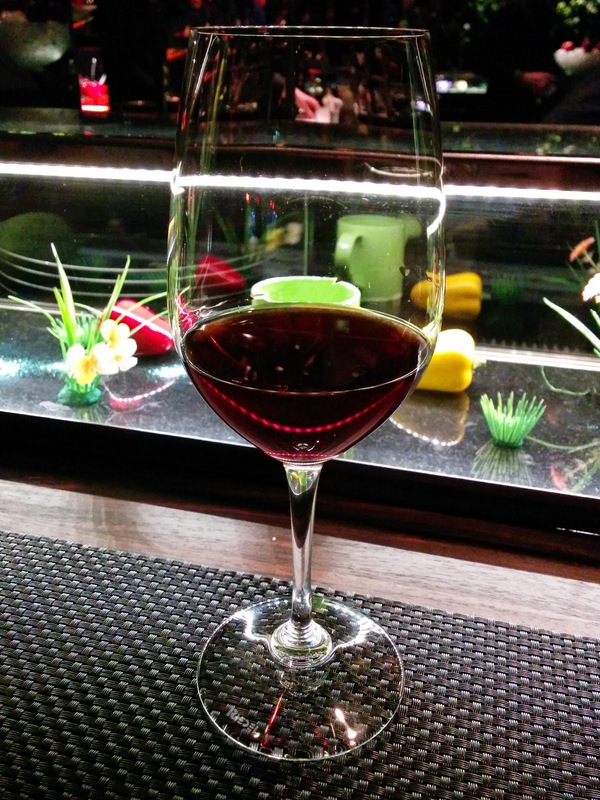 2011 Dow's Quinta do Bomfim Port. Speaking of dessert, you know how much I love desserts. Always a highlight of a meal for me. But in Tokyo, there was pretty much nothing on the L'Atelier dessert menu that I wanted. I still tried the La Mandarine, but didn't really care for it. The same thing happened in London. The non-caffeinated dessert options were only lemon or orange based, and, although I like citrus, I just don't tend to like it in my desserts. To be fair, if I ate chocolate in the evenings, there were plenty of options on the menu, and, in Tokyo, my dining companions enjoyed their chocolate dessert. So, I actually used restraint, and decided to skip dessert. Of course, it helped that I knew my dining companion, Emil, would not help me out with a dessert at all, so I'd have to eat the whole thing myself. And, I was full and quite satisfied by those ridiculous mashed potatoes. But, you know me, if there was something that actually sounded good, I would have gotten it anyway. Instead, Emil ordered us "liquid dessert", a glass of port for me, a double espresso for him. The port was good, but all I was still thinking about was those potatoes. Even though we didn't order dessert, we were still presented with a tray of mignardises. Since Emil doesn't eat sweets, the whole platter was for me. 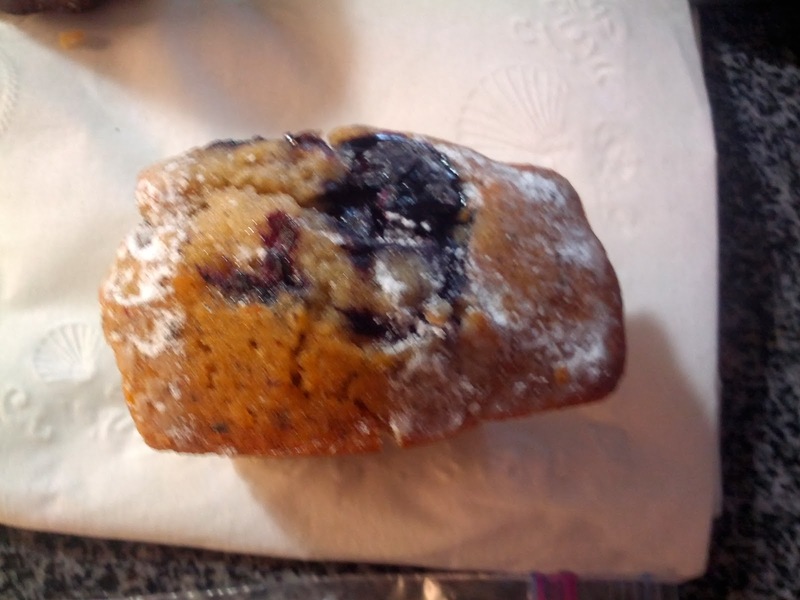 I never care for financiars, but they were nice and moist, with a good amount of jam on the inside, well distributed. But still, just financiars. The marshmallows on the other hand were amazing! Fluffy, fresh, sweet, with a really incredible yuzu flavor. I really liked these, and gladly consumed the extra. A few months ago, I was walking by the Metreon and saw a new casual dining establishment about to open: Noodles & Company. Perhaps Noodles & Company is not novel to you, as they apparently exist all over the US (400+ locations), but, it was new to me. The Metreon location was their first San Francisco branch. I kept meaning to swing by after they opened to learn more, but, I uh, tend to avoid that area, and totally forgot about it. But a few months later, I saw that they were opening a second location, just a few blocks away on Market Street, only a few months later. Strange to put both locations so close to each other, but, the second one is in a much nicer location for those of us who don't want to get trampled my conference-goers. As you may have guessed, the menu features noodles, from all over the world. The menu ranges from standard "American" noodle dishes such as Mac & Cheese, Spaghetti & Meatballs, and Steak Stroganoff to Italian inspired dishes like Penne Rosa, Pesto Cavatappi, and Alfredo, to Asian dishes like Pad Thai, Bangkok Curry, and Japanese Pan Noodles. The options don't stop there however, for every dish, you can add a protein option, from a selection including tofu, pork, chicken breast (parmesan-crusted or grilled), steak, shrimp, or meatballs. Suggestions for the best pairing are given on the menu, but really, you can do whatever you want; if you want meatballs on your pad thai, no one will stop you. You can customize your dish further as much as you want, removing the normally included vegetables, swapping out the pasta shape (or opting for gluten-free pasta), etc. If noodles aren't your thing, the menu also includes soups, salads, sandwiches, and flatbreads. 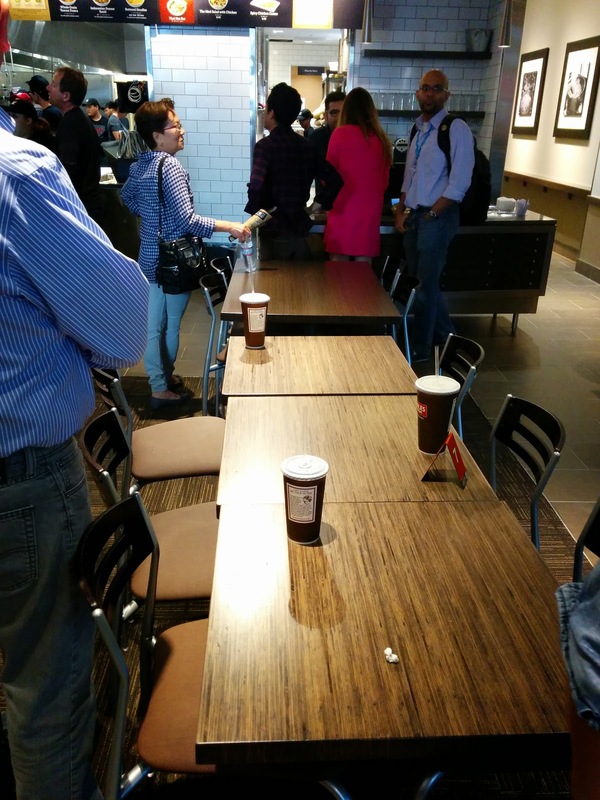 The style is the ever trendy fast-casual: order at a register and get a number to bring back to a table. Not too long after (about 5 minutes is what they claim), your meal is delivered directly to you by servers, who also swing by along the way and pick up dirty plates. The format reminded me a lot of Rubio's, which I've reviewed many times, in that it had quasi-table service, food somewhat cooked to order, and is easily customizable. However, Noodles & Company goes a few steps past Rubio's and provides real silverware, ceramic bowls, and real glasses. 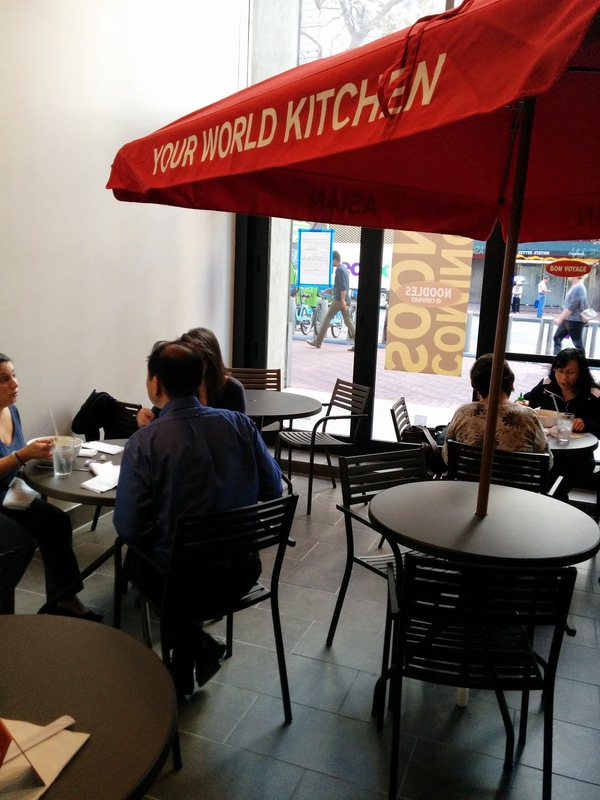 It may be fast-casual, but using real tableware really does change the feel. Overall, I was fairly surprised, and not just by the real dinnerware. The food was much higher quality than I expected given the price point and the casual nature, and in particular, the ingredients really did seem fresh, and care was even given to the plating of the dishes. The staff were all incredibly friendly on my visit, very eager to explain all the options. The main dining area has regular tables with chairs and an area with slightly taller communal tables with stools. There is also a rather strange hybrid indoor-outdoor area, which is where I ended up sitting. It is furnished as if outside, with patio tables and umbrellas, except it is completely indoors. Yes, there are glass walls on 3 sides, so it gets plenty of light, but there is a regular ceiling above. Certainly a strange design decision, but, it did almost sorta make me feel like I was eating on a patio somewhere, and most of the time, I wouldn't actually want to be on the San Francisco sidewalk anyway. Cola-Cola Freestyle Soft Drink Machine. 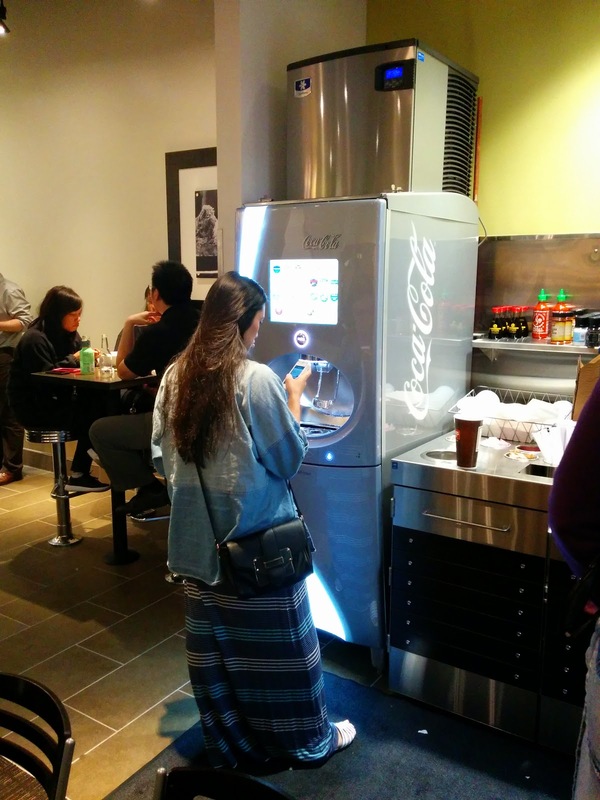 The soft drink machine was particularly notable, a Coca-Cola Freestyle, which I'd heard about, but never encountered before. I couldn't even tell you how many options it had, all Coca-Cola brand, but not just including soda. I was thrilled to discover that it had Dasani Sensations (flavored sparkling water). It uses a touch screen, and you drill down by categories to select your flavor of choice. Or mix and match as you please. I ended up trying a few different flavors, and was quite thrilled by my drink experience. When dining in, you are provided with a real glass. Not plastic, but actual glass. I realized that I'm pretty sure I've never used a soda fountain with a real glass, always a standard fast food paper one, or perhaps a plastic one, but never glass. This was also novel to me. Next to the soft drink machine is condiments (soy sauce, sriracha), along with napkins (thicker and higher quality than is standard at fast food restaurants), chopsticks (NOT the cheap kind you need to break apart, rather, round wooden ones, still disposable, but far higher quality than I was expecting), and, togo boxes. I loved the fact that they just had boxes available to pack up your own leftovers. Pad Thai + Brocoli. $5.99. "Rice noodle stir-fry with scrambled egg, carrots, cabbage, sweet chili, citrus, peanuts, Asian sprouts and cilantro." I was incredibly indecisive about what dish to get (I know, imagine that). Of the Italian options, the Penne Rosa was the top contender, with a creamy tomato sauce plus mushrooms and spinach. But so was the spicy Indonesian Peanut Sauté from the Asian section. And strangely, I also wanted the Spinach & Fresh Fruit Salad (come on, it has bacon and blue cheese!). 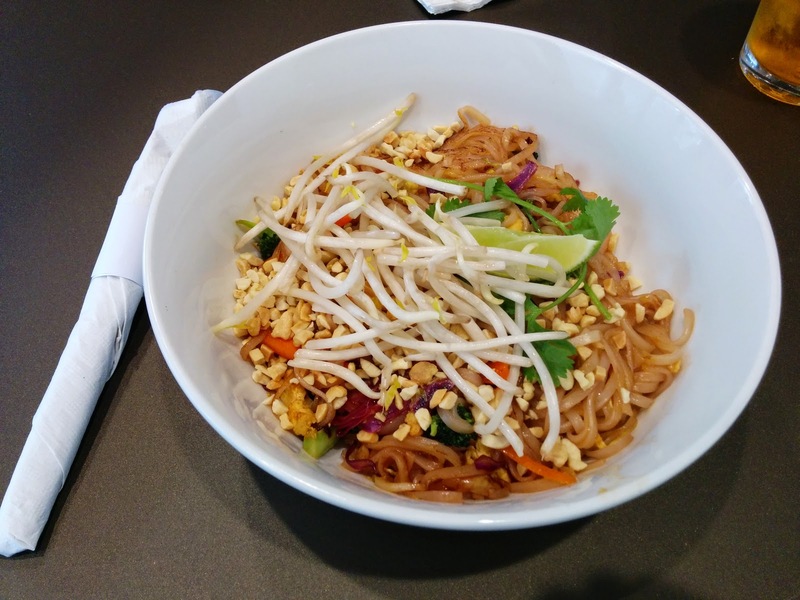 While I was waiting in line, I asked an employee what her favorite was, and she told me the pad thai, and warned against the Indonesian Peanut Sauté, saying it was really spicy. So, I took her recommendation, as I do like pad thai, and it had been a long time since I had any. None of the protein options sounded appealing though, besides meatballs, but um, I knew meatballs didn't go with pad thai. I wanted to add a little something to my pad thai though, so I asked if I could have broccoli added. I know broccoli doesn't normally go in pad thai, but they have it for other dishes, and I thought it would soak up the sauce nicely. It was no problem to customize in this way. After about 8 minutes, my dish was delivered to my table, piping hot, along with real silverware. Seriously, seriously hot. Every time I dug back in, steam would come out. They clearly do prepare dishes fresh to order and serve them immediately. Points for that. Points also for the presentation, served in a modern style bowl. I wasn't expecting, at this price point, to have a dish plated so well. My noodles were garnished with crushed peanuts, sprigs of fresh cilantro, crispy bean sprouts, and a lime wedge to squeeze over the dish. The toppings in particular all seemed higher quality than I expected, the cilantro wasn't limp or wilted, the bean sprouts still crispy. Mixed with the rice noodles were julienned carrots, that were actually cooked really well. They were not mushy, as happens so often with carrots, but they also weren't undercooked. Just a bit al dente, how I like them. The noodles were unremarkable, but not mushy, not stuck together. There was a good amount of scrambled egg too, which I appreciated since I didn't add other protein. The egg wasn't rubbery or tough. The broccoli I added did indeed soak up some sauce, as I was hoping. This all sounds successful, right? Except ... I really didn't like the sauce. It was sweet and very one-dimensional. The amount of sauce was correct, it wasn't overdressed or anything, but, I just really didn't like the flavor, so it ruined the dish for me. So, I didn't like my pad thai. But, I really did appreciate how well done it was, and my experience makes me curious to try their other dishes. The quality was much higher than I was expecting. Did I mention that this entire giant bowl was only $5.99? Cadbury is in fact a British company, so it should be no surprise that the selection offered there is much greater than what we see here in the US (yes, Cadbury really does make more than just Creme Eggs). 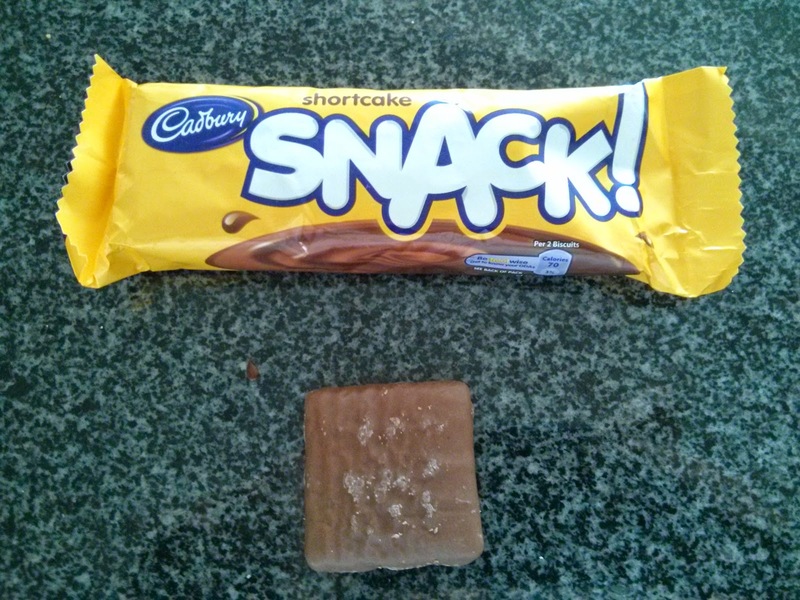 Since I ate my share of Cadbury while living in Australia, I wasn't that excited about the regular chocolates, but there was one item that caught my eye, based on the name alone: SNACK! What is a SNACK!, anyway? It sure sounds exciting. But, because it is annoying to type, and read, I'll refrain from calling it SNACK! anymore, and just go with "Snack". The Snack line of products contains 3 different items: Snack Wafer (chocolate covered wafers), Snack Sandwich (chocolate covered chocolate and biscuit sandwich), and Snack Shortcake (chocolate covered shortbread). Each comes in a bright wrapper (pink, purple, or yellow, respectively), all bearing the SNACK! logo. They are not to be confused with Cadbury Snack products in Australia, which is entirely different (blocks of strawberry, pineapple, orange, coconut ice, Turkish delight and caramel covered in milk chocolate). Note to self: next time I'm in Australia, try this version of Snack too. The classic product from the Snack line is the Shortcake, so that is what I tried. It has been around since the 1950s and is apparently very popular in Ireland. I don't really see why. My package contained 6 squares. Each was a very generic, totally unremarkable, dry shortbread, coated in equally unremarkable, generic milk chocolate. Some Cadbury chocolate is actually really creamy, but this layer was too thin to really appreciate the milk chocolate. It was just dry biscuit, not very buttery or sweet. Perhaps an acquired taste? I certainly wasn't into this. Ojan however really liked it. He declared it as a nice variation on a Twix, basically, Twix without caramel.